Discount Parking for the Paul Brown Stadium. 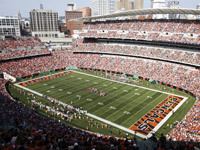 Parking.com offers convenient parking for events at the Paul Brown Stadium, home to the Cincinnati Bengals. Paul Brown Stadium, a major sports stadium in Cincinnati, is named for the founder of the Cincinnati Bengals. The stadium consists of 22 acres and seats almost 66,000 people for events such as the Big East Conference as well as numerous entertainment events including the annual Macy's Music Festival.